Curse of Snakes Valley | What The Fest!? Before the film, Maria Reinup (What The Fest!? Creative Director) will introduce some of the most obscure, acid-like animations from the USSR to broaden up the perspective of what else kids saw in Soviet Union. Come get your eyeballs melted! NYC PREMIERE Hungry for undiscovered gems from exotic regions? This Polish-Estonian delight from the USSR will deliver! A rare treat and a genuine surprise for fans of obscure European genre films, CURSE is one of many titles initially made to fill in the Eastern Bloc’s gap of not having midnight movies or western productions, and that were essentially lost when the USSR disappeared. 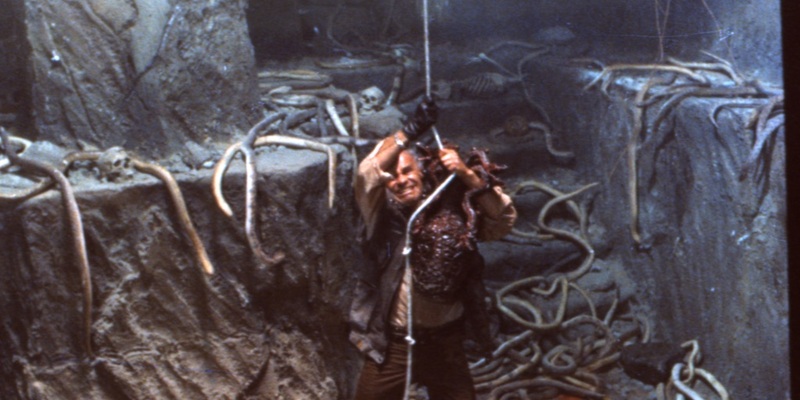 Often called “The Soviet Indiana Jones,” this is one of the best examples – shot and released in the late 80s during the “melting period,” it was a wonderfully scary adventure film for a whole generation of people who only learned about the real Indiana Jones years later. It was enormously popular, too: a whopping 32 million people in the USSR and Eastern Europe saw it at the time. But especially amazing is that it really is an almost a perfect combination of the “classic weirdness” of Polish sci-fi and, well, a real Indiana Jones movie. Marek Piestrak, a cult director of the era (he has a few more gems up his sleeve!) who also assisted Polanski on Rosemary’s Baby, shot the film in Vietnam with a largely Estonian crew with very little in the way of of safety equipment or finances, achieving an impressive mysterious hidden temple/jungle atmosphere. And the soundtrack is by the legendary Sven Grünberg himself, one of the most interesting composers to ever come out of the Northern Europe. So as Estonia celebrates its centennial all around the world, I am proud to highlight a small part of little known cinema history and bring this beautifully restoration, overseen by the Estonian Film Institute, to have its very first screening for audiences anywhere here in New York as a symbolic cornerstone for our first edition of What The Fest! ?